Isn't she so sweet!!! 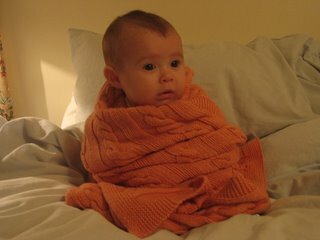 And she's wrapped in the hand knit blanket I made her - Debbie Bliss Cashmerino Baby!! Love that stuff even though I'm allergic to the merino wool in it. That's a nana's luv for you, I knit that for a couple of months and got eczema on my hands and eyes and sneezed and itched all the way through it. 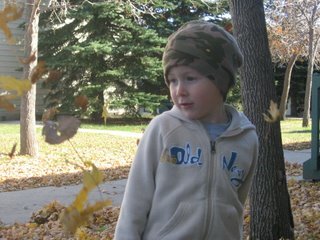 Here's hosea, playing in the leaves in Regina. I really miss the kids and Sheena. It's just not the same without them around. I can just feel the loss - it's palpable. Do you ever feel like that when someone you love isn't with you? I can't imagine being far from them for a longer length of time - thank goodness they'll be back in BC in a few weeks - but where in BC? That is the question. 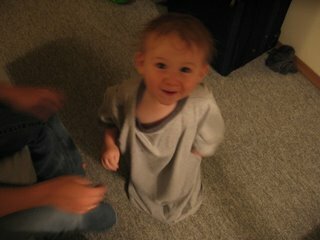 Here's Isaac! What a cutie pie! I miss him too, snuggling in bed together. I can't wait for them to get back here so we can do that again! Life just doesn't seem fair. I know for sure that it's not fair for many people. My troubles seem so small and insignificant compared to some others. However, I know that God is good. I know that He loves us and has a plan for each one of us. I just hope His plan is for my kids to be close to me!